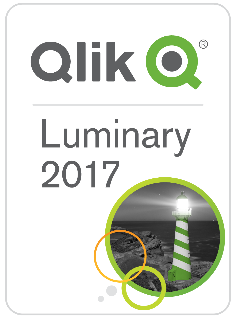 For a number of years now Qlik have been running a Luminary program with a new class chosen each year. Luminaries are people who are highly visible on the Qlik eco system and who are very forward with their passion of the product. Often running blog sites, writing books, presenting and helping people get the most from the product on the Qlik community. From 2014 when a good friend and former colleague Deepak Vadithala was awarded the title I have followed who’s who on the list each January and its with great pleasure I can announce I’m amongst their number for the class of 2017! As a Qlik Luminary I’ll continue to share all that I can around Qlik here on my blog and I will continue with the QlikDevGroup (as long as they will have me). I look forward to an exciting year ahead embracing all the opportunities the Luminary program has to offer. I’d also like to take a moment to congratulate all who made the list this year, I look forward to catching up with you all very soon. For a complete list of who were successful this year please visit the Qlik Luminary page.